Tones Not Showing in iTunes 12.7, How to Transfer Ringtones! Lots of users may be confused after updating to iTunes 12.7, because Tones tab is invisible in this iTunes 2017. Even you uninstall and reinstall it again, the tones tab is till not showing on iTunes. Is it the bug of the iTunes 12.7? You may doubt that. But it’s actually Apple that remove tones tab from iTunes. Tones Not Showing in iTunes 12.7! How to Transfer Ringtones to iPhone? Now that we have identified the source of the inconvenience, let's see how you can transfer your ringtones to your iPhone without much stress. There are basically two ways of doing so and we are going to talk about both so that you will be able to choose which method suits you best. Though iTunes limits the ringtone function, you can make and add your ringtones to iPhone/iPad the way you like. There are some alternatives to iTunes that can make and transfer ringtones easily in one place. iMyFone TunesMate is one of best. It’s an overall iPhone data manager that allows you to transfer files between iPhone and computer freely. It also works perfect for anything related to ringtones. Create the ringtones by deciding the precise section of a song, while listening to it. Make the tones using the music from computer or iPhone. Preview the custom tones before you save it on computer or transfer to iPhone directly. “Fade in” and “Fade out” is available to modify your tones. Two-Way Transfer: Freely transfer files between iPhone and computer, including music, videos, ringtones, playlists, photos, files, and more. Step 1: Connect your iPhone to computer and locate iMyFone TunesMate. 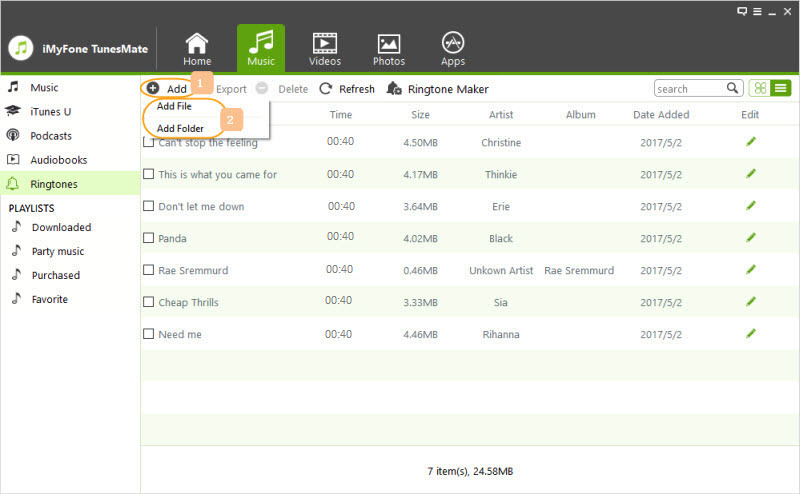 Step 2: Choose “Music” tab and select “Ringtones” from the left sidebar. Use “Add > Add File” button to import ringtones to iPhone from computer. Step 1: Launch TunesMate and then connect your iPhone to your computer. Step 2: Click on the Music icon and then Ringtones. At the Music Window, click on the “Ringtone Maker” button. Then, click on Device Music or Computer Music to choose the song. Ringtone Audition: You can use this function to preview the tones before you save it. Step 4: Finally, click “Save to PC” or “Save to iDevice” and save the custom ringtones. 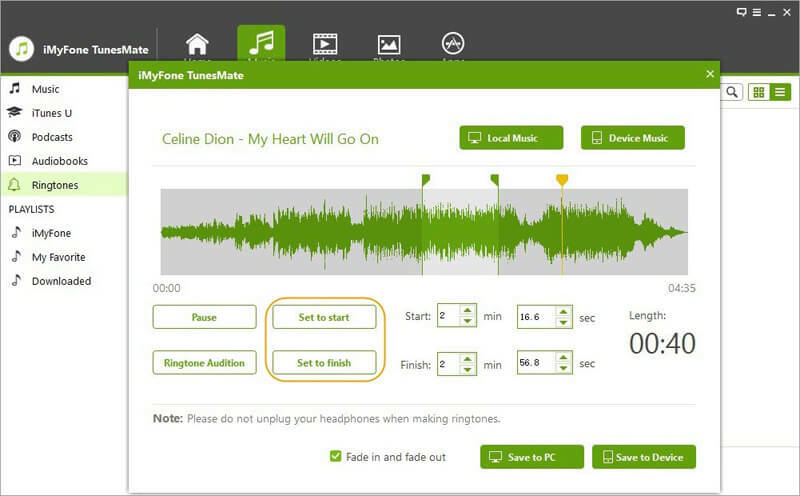 With iMyFone TunesMate, you don’t need to bear any limits or errors with iTunes any more. It's recommended to be the ultimate alternative to iTunes by famous software review media, like getintopc.com, tricksworldzz.com, crunchytricks.com, etc. Although the iTunes 12.7 doesn’t show Tones tab any more, you can still make and transfer your custom ringtones using iTunes, which is via the Drag-and-drop function. The process just like the first one is very easy but, you will need to make your custom ringtones first. After making your custom ringtones, follow the steps below to transfer tones to your iPhone. Step 1: Open iTunes on your computer and connect your iPhone. Step 2: When iTunes detect your device, click the device tab from the upper left corner. Step 3: You will be in the window of Summary. On the right side, you will find the Options section. Check “Manually manage videos”. Step 4: Tap “Tone” under On My Device from the left sidebar. Step 5: Locate your .m4r ringtone files, drag and drop them from a Finder (on Mac) or explorer (on Windows) into into iTunes library and the file will be copied into your device. How to Turn Voice Memo into Ringtone?